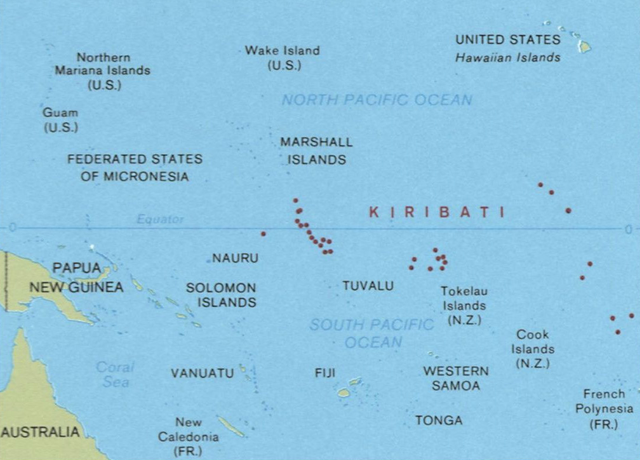 Kiribati is pronounced "Kiribas". It is the local Gilbertese pronunciation of the word "Gilberts". Kiribati is an independent republic located in the central Pacific Ocean. The country is located about 4,000 km (about 2,500 mi) southwest of Hawaii. It is part of the Pacific islands that is known as Micronesia. Kiribati consists of 32 coral atolls (ring-shaped islands with central lagoons) and a raised limestone island (Banaba Island) in the Pacific Ocean and consists of three main island groups: the Gilbert Islands, the Phoenix Islands and the Line Islands. The total land area is only 811 sq km (313 sq mi). It straddles the equator and is spread over approximately 3.5 million sq km (2 million sq miles) of ocean resulting in the largest sea-to-land ratio in the world. Of the 33 islands only 21 are inhabited. 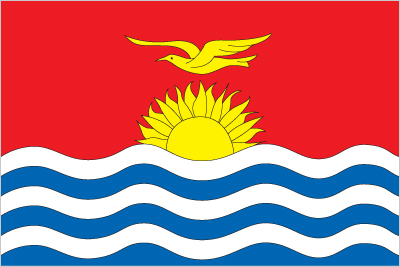 Kiribati have an average height above sea level of approximately two meters (about 6 feet). Atolls form over hundreds of millions of years. Coral barrier reefs form around a volcano and eventually the volcano sinks beneath the sea level. This leaves a lagoon surrounded by coral. The atoll land is only a few feet above the sea. Each lagoon is unique - some are vast while others are small and are completely encircled by land therefore resembling a lake. The lagoons are usually tidal with ocean water constantly moving in or out resulting in the lagoon constantly being replenished by fresh ocean water. Atolls do not have streams, fresh standing water or water tables underground and this creates a major challenge for living on an atoll. Fresh water cannot be captured and stored as it is on earthen soil because the atolls are mostly made of coral sand which is porous. 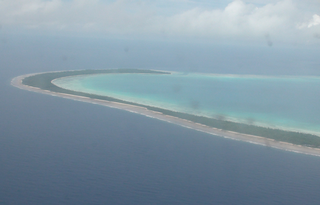 However, a freshwater lenses can form just below the surface of the atoll because fresh water is lighter than salt water (it can float on top of salt water). With rising sea levels fresh water is becoming more scarce because the fresh water becomes brackish due to salt water intrusion. 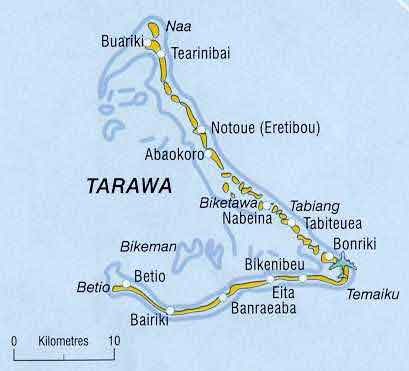 The capital of Kiribati is Tarawa in the Gilbert Islands. 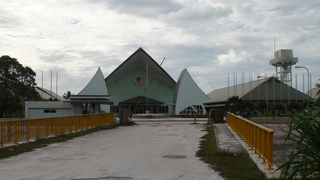 An islet of Tarawa (Bairiki) serves as an administrative center. The yellow frigatebird symbolizes authority and freedom. The 17 rays of the yellow rising sun represent the 16 Gilbert Islands and Banaba. The lower half is blue with three horizontal wavy white stripes. 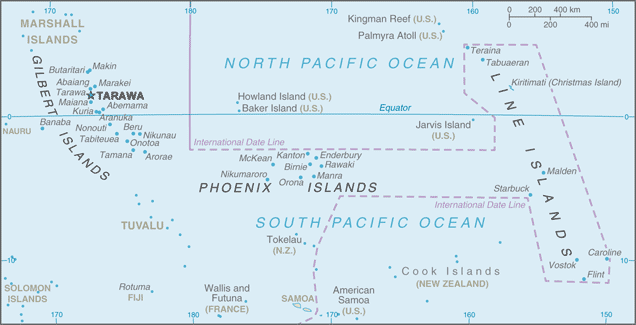 The blue represents the Pacific Ocean while the white stripes represent the three island groups in Kiribati - the Gilbert, Line, and Phoenix Islands. In Kiribati, households are to be "toamau". This means that they are balanced in age and gender so there is a good division of labour and everyday needs are met. A household needs enough members to carry out essential tasks such as fishing, cutting copra and toddy, cooking, making crafts and gardening. Traditionally, if a household was missing someone, the extended family would provide one of their members to assist.